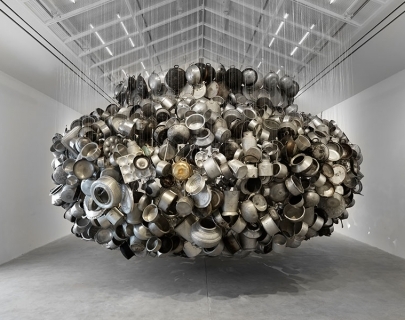 The Mead Gallery presents a major exhibition by one of India’s foremost contemporary artists, Subodh Gupta. Subodh Gupta is famous for transforming the everyday materials of Indian life into artworks. Working across painting, sculpture and installation, in Gupta’s hands objects such as tiffin boxes, cooking utensils and milk pails are used to reflect on the economic transformation of India during his lifetime and question the ambivalence of a society caught between traditional customs and globalisation, booming wealth and poverty. The artist’s work – beautiful, sensuous and frequently spectacular – encourages viewers to question the material, cultural and spiritual values attributed to objects, including pondering the inner life of used and discarded cooking vessels. Subodh Gupta was born in Khagaul, Bihar, in India in 1964 and now lives and works in New Delhi. The artist has exhibited internationally at galleries including the National Gallery of Australia in Melbourne; the Victoria and Albert Museum, London; and the National Gallery of Modern Art in New Delhi. He is represented by Hauser & Wirth in Zurich, London, New York, Somerset and Los Angeles.